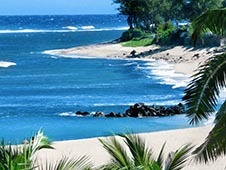 One of the most popular tourist centers of France is considered to be the island of Reunion, the administrative region, whose territory is located to the east of Madagascar. The shores are washed by the French colony of the Indian Ocean, its land considered very remote area, which is part of the Eurozone. Title Reunion gave Arab fishermen who once are sailing close to the volcanic island. Later on this ground came the Portuguese, and then he came into the possession of the French. The island is of volcanic origin, it attracts tourists in unspoiled nature, the abundance of rivers with picturesque waterfalls. Climate Reunion cool, dry, making it stay as comfortable as possible. Here summer lasts from April to November, this time it attracts thousands of tourists. The island is small, so its territory limited number of resort hotels. For relaxation, there is provided everything stadiums golf, tennis, spa. If you want to visit the mountains, you can stay in private accommodation, some of which are located near the thermal springs. Getting around the island is most convenient in a rented car in Reunion. This can be done in advance via the Internet, online, by sending a request directly from the house. A wide range of services on the armoring of auto site provides bookingcar.ru. Here you can order the car before the trip by renting it anywhere in the world. Park your rental car in Reunion simple, the main thing - to choose for this the closest parking, street parking in the marked area. Parking on the island paid, however, in the period from 12:00 to 14:00 free of charge. Leave the car in the same place for more than a day is prohibited, with the exception - the long-term parking lot where the car can stay indefinitely. Billing, schedule parking written on a sign. If this parking machine, all the terms of service are indicated directly on the unit. Standard cost of street parking is about 0,65-1 €. When the car is parked properly, will have to pay a fine which according to the laws in force here is 40 €. Trails on the island of narrow, winding, because the area is 60% rock, volcanoes, lava landslides. Pointers on the streets there, but not enough of them, so there will not be like the way, the car GPS-navigator. Speed ​​limits movement in Reunion - similar to that which operates in the rest of France. On the highway the minimum speed of 80 km / h, if the visibility is very limited, allowed to go no higher than the figure of 50 km / h. To monitor compliance with driving rules set cameras, as road workers supervise Highway Patrol. When renting a car driver must be at least 20 years, while he should have driving experience of 1 year or more. When managing a machine driver must have the right international standard insurance policy. Also in the car has to be reflective vest, warning triangle, fire extinguisher, first aid kit, a set of spare bulbs for headlights. The driver sitting behind the wheel, to be sober, permissible levels of alcohol in the island - 0,2 ‰. For excess of the level of intoxication would have to pay a fine of 135 €. In addition, according to the law the driver must carry a disposable breathalyzer. During the day, if the visibility is limited, it is necessary to include the lights dim lighting, this rule also applies when passing through tunnels. For all-wheel drive cars, it is desirable to use a permanent dipped. The penalty for driving at night, when visibility is reduced and switched off the headlights is 135 €. A similar amount will have to pay if the driver, front passenger and rear seats are moved without the use of seat belts. During the conduct of the machine motorist not allowed to talk on a cell phone. To this end, a means of communication must be fitted with a special headset. Failure to comply with the rules is fraught with a fine, the amount of which is 135 €.